Crocknafarragh is the 513th highest place in Ireland. Followed Harry Goodman's advice and climbed Crocknafarragh on 13. June as part of a five-summit circuit, also including Grogan More, Crocknafarragh SE Top, Crockglass and Addernymore. Started from north of Lough Keel at B8462 1676 K and tackled Grogan More first before making my way to Crocknafarragh. 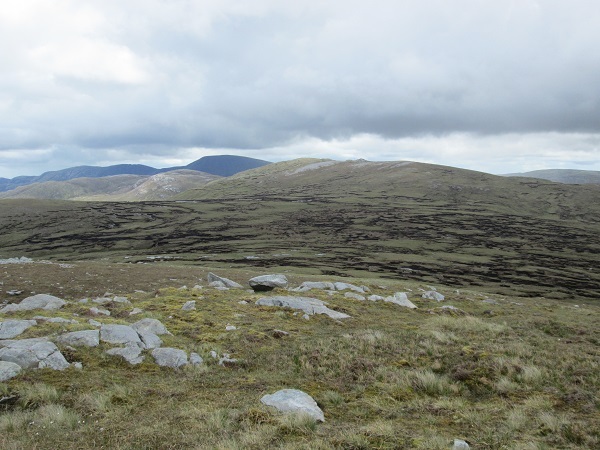 As seen on picture, and as described by Harry and eflanaga, the col between the two summits is covered with peat hags. Therefore I decided to head towards Grogan Beg (flat summit left on the picture, 424m point on OSI map), which was a good idea as it enabled me to enjoy firm ground and great views over Errigal and its neighbours between two peat hag sections. After crossing the last peat hags, a regular ascent starts, getting easier as the ground becomes firmer. From Grogan More through Grogan Beg, it is a 45-50 min walk to the 503m point (small rocky mound right of the summit on picture). Add a few more minutes to reach the top at 517m. Fantastic views all around, to Grogan More, the ocean and Tievealehid to the north, Errigal and Dooish to the north-east, and the Slieve Snaght range (see picture) to the south-east (could not see much to the west and south because of the cloudy weather). Prominent as it is, Crocknafarragh happens to be a good landmark to identify the surrounding summits. From the top it is a short, highly recommended stroll to Crocknafarragh SE Top (12-15 min) and Crockglass (add another 15 min). Finally made my way to Addernymore and back to the car via the road south of Lough Keel. I would not necessarily recommend climbing Addernymore -unless you are a hill-bagger !- but going back along the ridge west of Crocknafarragh through 409m point. Or maybe continuing on the ridge north of Crockglass and down to Dunlewy Lough (if two cars available)... or maybe even starting a four-summit trip from there ?